** The inclusion of oats as part of a varied and balanced diet low in saturated fat can help reduce blood cholesterol. One 30g portion provides 1.35g of beta glucan soluble fibre from whole oats which is 45% of the 3g recommended intake. The beneficial effect is obtained with a daily intake of 3g of oat beta glucan. Store in a cool dry place with the lid sealed correctly. Ensure scoop is dry before placing back into the drum. 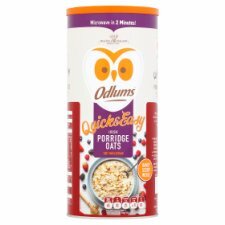 Add 2 level scoops (30g) of Odlums Quick & Easy Porridge Oats and 4 scoops (160ml) of water or milk into a deep microwaveable bowl. Stir well. Stir, allow to stand for 1 minute and serve. It's that simple!